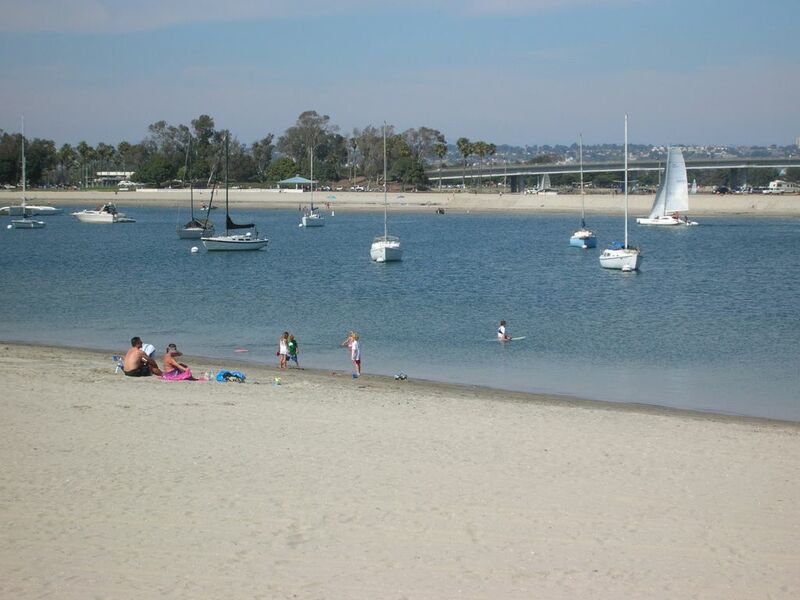 The condo is located on the water's edge of south Mission Bay on Mariner's Basin. Mariner's Basin is the most popular Mission Bay cove for yachts to dock for the weekend - directly in front of this condo! The view is one of the best - if not THE best in Mission Beach. The unit includes two bedrooms, two baths and spectacular panoramic views of Mission Bay and Riviera style beach. The Pacific Ocean and jetty are just steps away with the Bay at the front door, all connected by the famous Mission Beach boardwalk. Amenities include: Secure WiFi, DVD, wet bar, BBQ, two balconies and a large, fully equiped kitchen. The huge master bedroom also features Bay views and a queen size bed. The guest bedroom also includes Bay and beach views and twin beds. Secure garage parking is provided for TWO CARS! All major San Diego points of interest are just minutes away including the San Diego Airport, Sea World, San Diego Zoo, La Jolla, Gaslamp District, Little Italy, Old Town, San Diego Harbor, Mexico and Sea Port Village. World class golf courses and other attractions abound in the Mission Beach, San Diego area. Bicycle, surfboard, and skate rentals are available at the nearby Belmont Park. The restored roller coaster 'The Coaster', and 'The Plunge', a huge indoor swimming pool, are also located at Belmont Park. A transplant from Chicago, my wife and I have lived in San Diego for the past 37 years. We've lived near the beach all that time and have been particularly attracted to the bay side in South Mission because of it's tranquility and beautiful scenery. South Mission Beach was an attraction to me as far back as 1965. I met my wife there and we both still enjoy the beauty and serenity of this location. the bayside is uniquely quiet compared to the ocean side. Our unit while on the first floor is raised about 8 ft above ground level which affords a great deal of privacy. We also have access to our own balconies which sweep along the side and front of the unit providing more openness and visibility to the surrounding beauty. Free long distance within continental U.S.
New LG refrigerator 26 cu ft.
All utensils. pots and pans provided. (2) Balcony directly in front facing the bay. Also balconies stretch full length outside both MBR and 2nd br. short stairwell up from underground garage. First time staying in Mission Beach and we loved it! The property is newly remodeled and offers all the amenities of being home. This was our first trip to Mission Beach and we really couldn't have picked a better location. Walking right outside the unit and you were on the bay or a short walk to the ocean. Riding bikes along the bay or talking a walk was a daily occurrence. Sitting out on the balcony was so relaxing. I would recommend 2 things. The first that the kitchen needs more frying pans, there was only 1, and it was the smallest size. The second would be to provide better fans for the bedrooms for the summer time. One was inoperable and the other didn't blow very well at all. Mr. Walsh was a pleasure to work with. We accidentally left a movie in the DVD player and he was gracious enough to mail to back to us. Wonderful place to enjoy the beach or bay. Lots of wonderful restaurants within in biking and walking distance. Owner is very friendly. First off, we are very frequent users of HoweAway vacation properties, we stayed in 20+ rentals in 10 countries. This rental is the first where reviews are completely not correlated with the quality, and the first one where we are giving less than 4 or 5 starts. We completely agree with another 2 star review (posted Sept 2012), it is very accurate. John, I would urge you to actually take into consideration feedback before dismissing it with a sentence " this is the first time somebody complained about it", it wouldn't cost much to address the concerns and the rental would be much better (and you could charge more money). - Location is perfect, it is hard to beat. It is right on the bay beach, we spent a good portion of the day there, we swam, played and enjoyed it very much. This beach is very safe for kids, ours enjoyed it a lot. It is just few minutes walk to the Pacific-side beach, if you are more inclined toward surfing, or boogie boarding. You can walk for miles, there are stores and restaurants around, it is just perfect location. It is in the more quiet portion of the Mission beach, which also a plus. One really doesn't need to drive anywhere, but having 2 car reserved garage is also a great plus in very busy area with hard-to-find parking. Kitchen has been updated and is well stocked. Negatives: The furniture is very old, uncomfortable and dirty. Master bedroom summary: (1) Very saggy mattress, I didn't sleep at all first night and had to request air mattress (which John brought very promptly), (2) Stained carpet, (3) drawers falling from the dressers. Common area: (1) Super stained chairs, had to put towels for kids to sit on them, (2) Stained sofa (again had to put sheet on top of it, looked too dirty), (3) Bathrooms are outdated. It seems like there was a very bad attempt to update, the worst craftsmanship I've seen ever, (4) Balcony furniture- it exists, but it was extremely dirty. Cleanliness: I would advise John to change cleaning people, they did very poor job. Washer and dryer: dryer is rusted, it destroyed some of our clothes. Sheets, towels: very worn out, had stains (after washing). It wouldn't take a lot of money to change them, and it would make a huge difference. Summary: this could be a great place, but it was disappointment. Don't believe 5* reviews! I'm sorry you didn't enjoy your stay. I guess you wanted to pay more but you chose to pay less. Your response was way out of line. The idea that you couldn't tell me unit was dirty until after you left is a lie. That the mattress was saggy is a personal opinion and relative. My wife and I slept very comfortably on it after 9 month tenants left. Not saggy at all!! Watch for karma! We had a great time and the condo was very nice and comfortable and the location was great too. This condo worked out very well for myself, my daughter and her three 13 year old triplets! Location was perfect and we spent our mornings at the bay beach and our afternoons at the ocean beach! The condo met all of our needs and it was difficult to leave at the end of the week! We had everything we needed and more! This is a wonderful location, on the bay, across the street is the ocean. John is a very responsive owner. If we need something we get it immediately. We hope to return next year which will be about our fifth year,The place is very clean and nicely furnished.